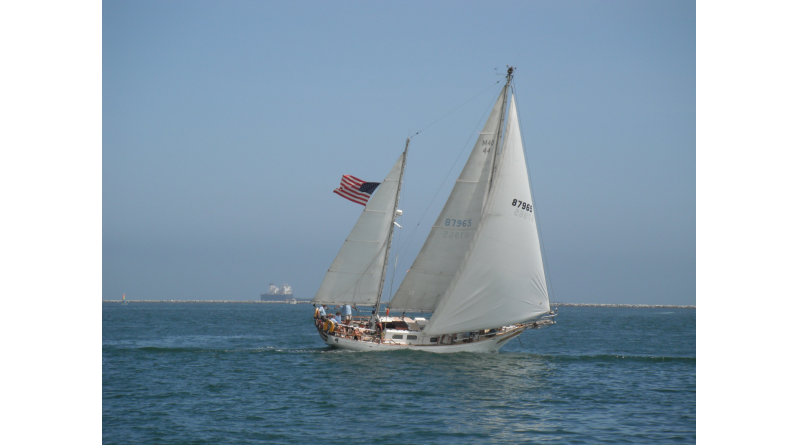 The weather cleared for sailors competing in the Eric Erickson Oil Race in Long Beach making for a nice day of racing. LONG BEACH — There was wind blowing as early as 9:30 a.m. in Long Beach but it quickly gave way to a pea soup fog inside the breakwater in late July, making it difficult for racers to compete during the Eric Erickson Oil Island Race. The projected first start came and went, the postponement flag went up and all but three of the eight competitors returned and docked at Long Beach Yacht Club and waited, according to race officials. By 1 p.m. the fog had vanished and the boats were started in very light air in pursuit start fashion. The winds built to 12-15 knots and what had started out as a grey, foggy day turned into a beautiful sunny day with perfect conditions. The 8.5-mile course took the boats from Chaffee to White Island, past Freeman, out Queen’s Gate and back inside to Alamitos Bay to a finish line opposite Long Beach Yacht Club’s flagpole. Soon after the committee boat docked, Long Beach YC Rear Commodore Bill Durant’s 50-foot Lapworth sloop, Sumatra, finished first, followed closely by Hidalgo, a Kettenburg 46. Jon Duff’s Kettenburg 43 Raiatea was third. Skipper Tim Bercovitz and his Mariner 40 Fairwind took first in Ketches and was followed by Chris Frost’s Mariner 35 Distant Star. Fairwind had trailed Star until coming inside the Alamitos entrance and overtook her to win class by three seconds. The conditions didn’t favor single or split rigs and all boats finished by 5 p.m.
Sumatra was the overall winner. The racers and crew had a BBQ dinner and cocktails after the race and wooden humidors hand-carved by members of Sumatra were handed out to the class and overall winners. A special perpetual trophy was handed out to 85-year-old Bercovitz. According to race records, he has entered every race of this type since day one.